The mountains around Agadir are beautiful. It is certainly worth renting a car in Agadir and getting out of town. It is easy to drive in Morocco, and for the most part the roads are deserted once you get out of the cities. The best part of the trip for me was in these areas – from the mountains to the edge of the Sahara – the people are wonderful and the scenery is breathtaking. Also, the food is very good though quite simple. One thing these parts are known for is honey. The most exotic comes from the pollen of the Argan tree – better known for its nuts that are made into oil for cooking and cosmetic use. 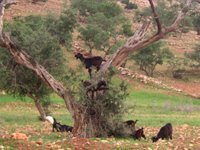 The strangest thing is that the process of extracting the oil involves goats climbing the trees, chewing the fruit and leaving the seed on the ground for easy collection. But I digress, for the goats have nothing to do with the honey, and the honey is excellent. You can buy it on the side of the road, and it is amber in colour and has a caramel taste that is like no other honey I have tried.